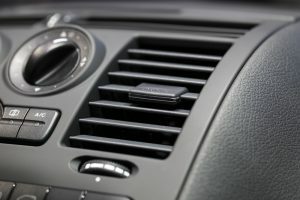 A malfunctioning air conditioner system in your car can make even a quick drive feel unbearable. Most of us here in Clearfield spend a lot of time in our car each day, whether we’re running errands, or commuting to and from Salt Lake. So if that air just isn’t as cool as it used to be, bring it in to our Clearfield Master Muffler shop for an inspection and repair. Our experienced, friendly team can quickly identify the problems and restore your air conditioning back to its former glory. Compressor: The compressor could be thought of as the powerhouse of the whole system. The compressor takes refrigerant in vapor form and compresses it, adding pressure that provides the impetus for the whole cycle. The compressor is powered by the serpentine belt, which is attached to the engine. Condenser: After being pressurized by the compressor, the still-vapor refrigerant moves along to the condenser, which fans the warm gas, cooling it enough to condense it into liquid form. Receiver-Drier: This highly-pressurized, hot liquid refrigerant next goes to the receiver-drier, whose job it is to filter the liquid and get rid of any impurities that could hurt the system. Thermal Expansion Valve: Next up is the expansion valve. Here, the refrigerant starts to move from its condensed form into an unpressurized, vapour form. The valve carefully gauges the release of the refrigerant to allow for expansion. Evaporator: The evaporator looks a lot like a radiator. Here, the refrigerant is given plenty of room to expand and evaporate. As it evaporates, it has much more capacity for heat, and so it quickly absorbs heat from the surrounding air, creating that nice chill that we love. The chilled air is blown through your vents to circulate around the cabin of the car. Once the refrigerant has evaporated, it’s funneled into the compressor again to start the cycle all over again. In addition to each of the parts above being able to function effectively, proper air conditioning requires two more things: (1) a closed, sealed system to maintain pressure, and (2) proper levels of refrigerant. Sometimes, a part will need to be replaced to help your air conditioning system work correctly. However, much of the time, the problem can be fixed by sealing up any leaks in the hoses or connections, and by flushing out and/or replenishing the refrigerant. Whatever the problem with your car’s cooling system, we can quickly identify and correct the issue. Our team in Clearfield has extensive experience, and can give you the personalized care that you deserve. Give us a call today.